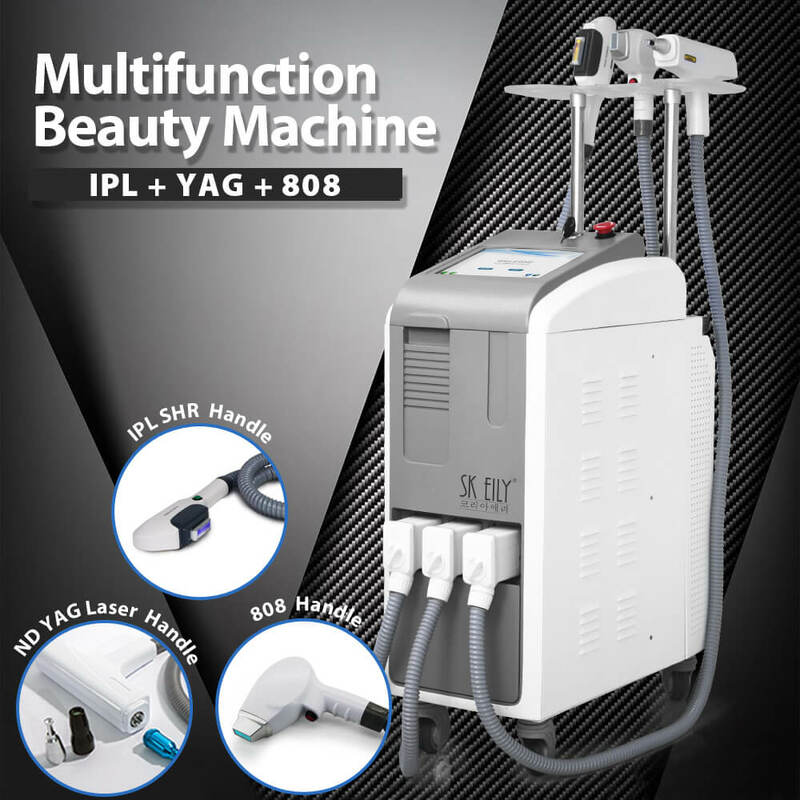 AL-340B is a 3 in 1 multifunctional beauty device, it combines 808nm Diode Laser system, IPL system, Nd-Yag Laser system in one machine, applies 3 treatment handles. Operating with two handles by the different system at the same time. one screen, double system. it bring you two machine effect but save money. Cooling Method Air+water+Semiconductor, Bigger water pump than common machine. Different machine chassis option matches the style of the hospital, clinic, salon, beauty spa, home use, etc. Vertical design with wheels. Easy to move. 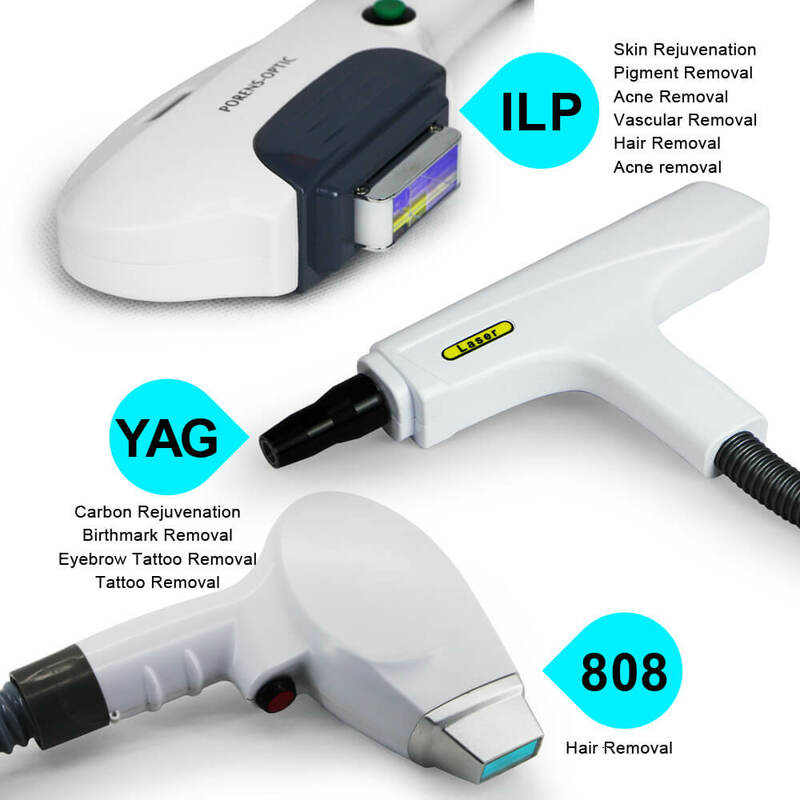 Hair removal: Permanently remove lip hair, beard hair, chest hair, armpit hair, hair on back, hair outside bikini line, etc. Fit for all kinds of colors. Skin care: Repair damaged skin safely and quickly whiten and tighten skin; an effective treatment for skin water shortage, coarse skin; minimize face pore, tiny wrinkle, remove vascular; effectively remove spots improve the elasticity and glossy of skin. Effectively remove sun spots, freckle, chloasma, age pigment, chorioplaque and all kinds of spots. 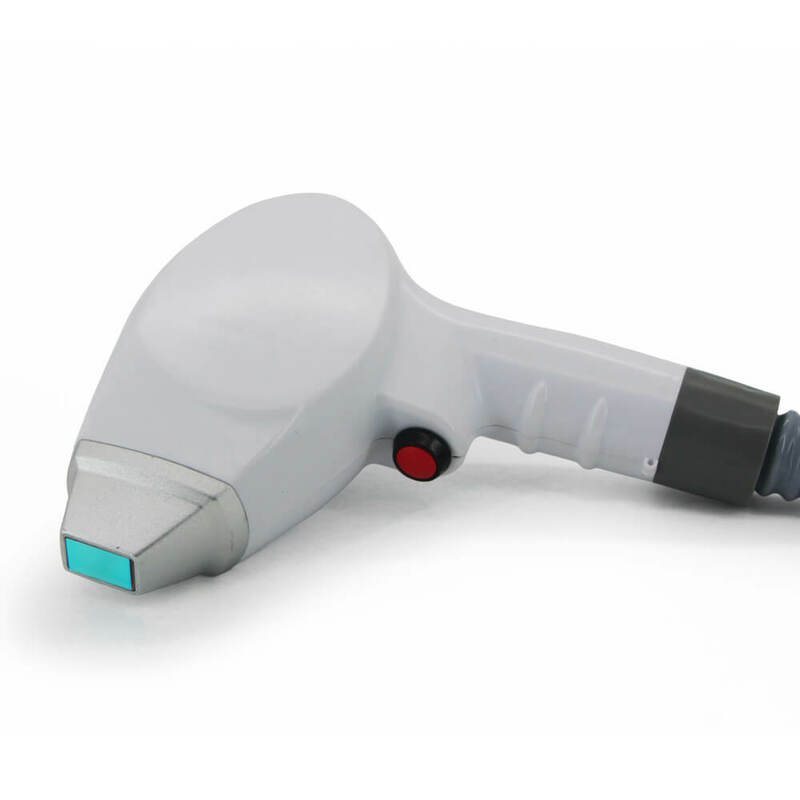 808nm DIODE LASER: The 808nm diode laser hair removal machine is a device that uses a special laser with a pulse width of 808nm which can effectively penetrate hair follicles. 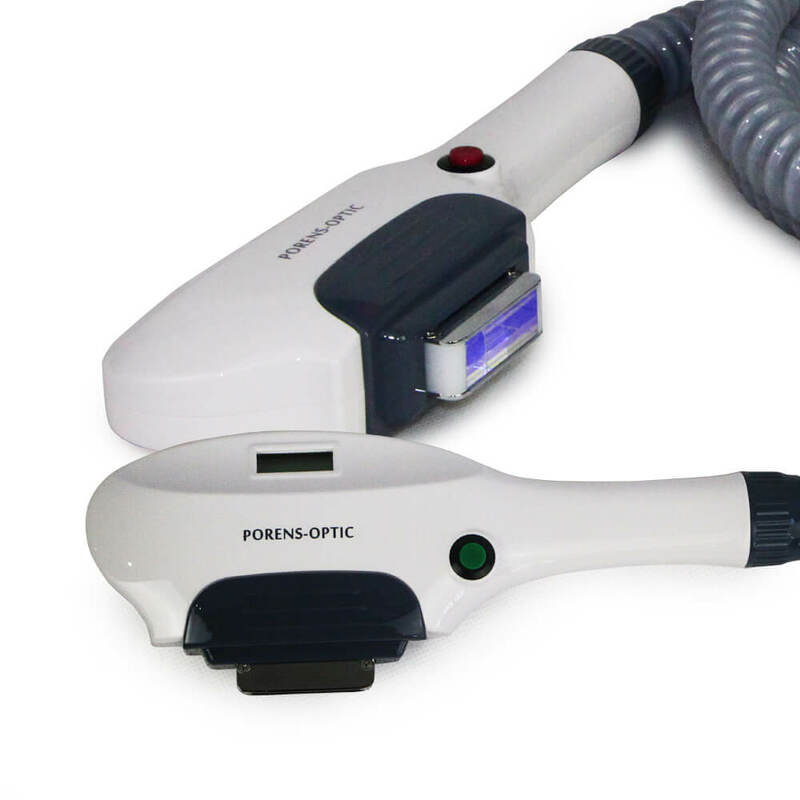 Using selective light absorption theory, the laser is preferentially absorbed by the melanin of the hair, heating the hair shaft and follicle, destroying the hair follicle and oxygen organization around it. After the hair removal laser fires, the system employs a special cooling process that cools the skin and protects against damage and discomfort. 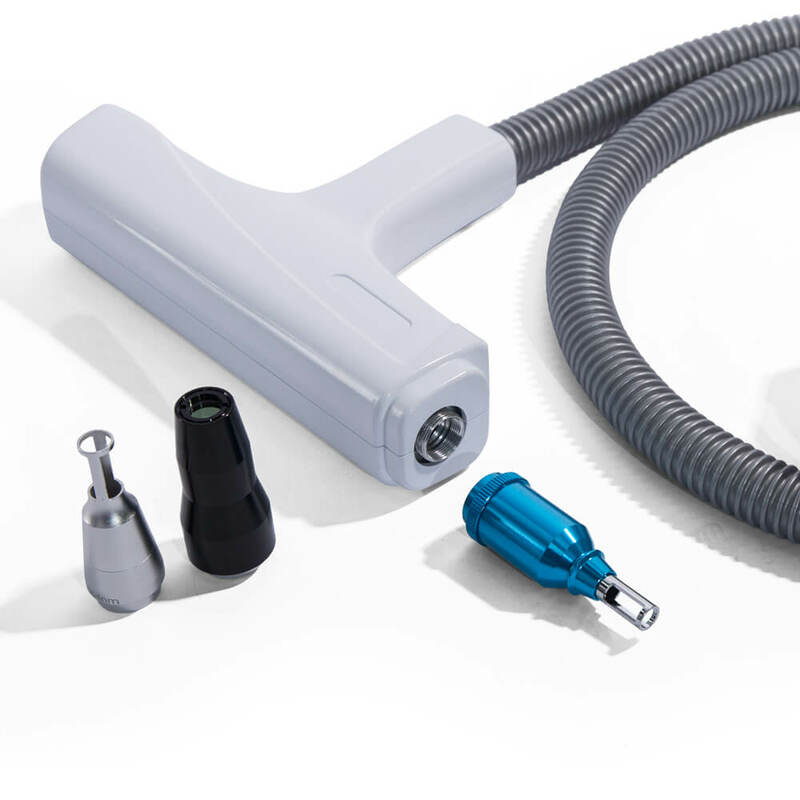 IPL (Intense Pulsed Light) is a kind of light with high energy and broad wavelength, within the range from 530nm to 1200nm. Photothermic and photochemical action will be triggered by the radiation of IPL. On one hand, IPL will promote collagen reproducing and recombining which makes the skin more flexible and smooth. On the other hand, the light with long wavelength can easily pass through epidermis layer and will be absorbed selectively in priority by pathological pigments which will be destroyed by high heat and get the effect of remove pigmentations, vascular lesions, and unwanted hair. 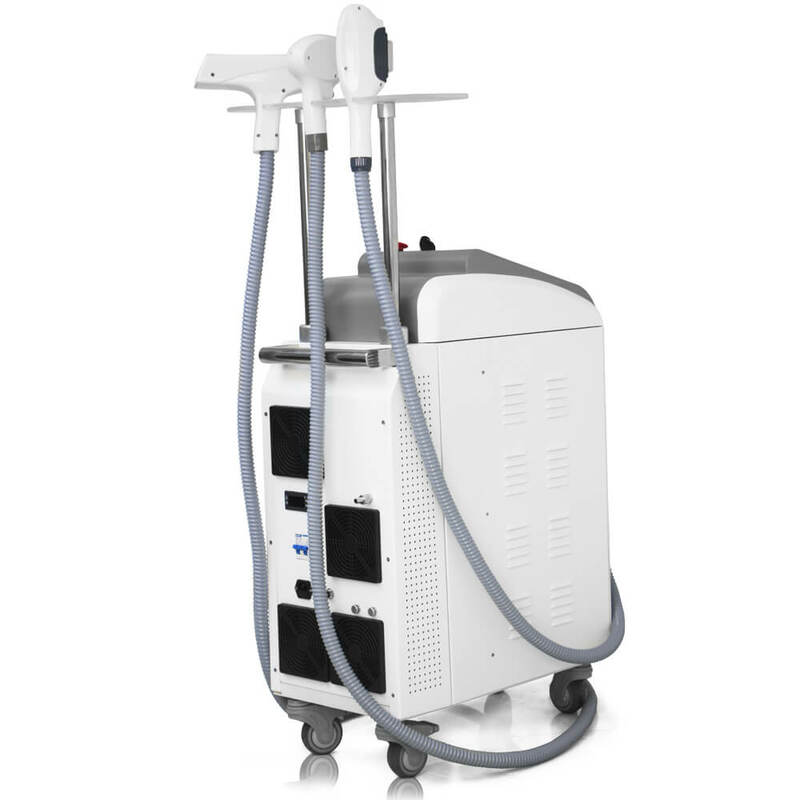 ND-YAG laser Tattoo removal machine gem Q-mode, the effective use of high-energy laser shot smashed the lesions in the pigment. The photo-induced burst principle: given the use of high-energy laser instantaneous, so that the irradiated energy is absorbed by pigment particles after the expansion of rupture, a split into more small particles removed from the body, part of the body excreted through the lymphatic system to remove the pigment. As the normal tissue of the 1064nm laser is not absorbed, thereby maintaining the integrity of the cell framework, the conditions must not form a scar. This is the way any other cannot be compared. Because eliminate the color laser does not destroy normal tissue. 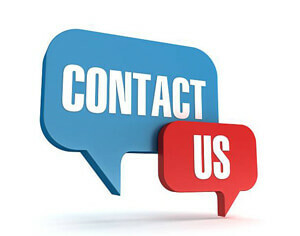 Therefore, the safety of the greatest hand to ensure customers will not be troubled by complications. The IPL handle provides quick and effective results of permanent hair reduction in all skin types, including tanned skin. The use of Optimal Cutting Technology (OPT) and the In-Touch Cooling technology for focused and effective treatment without pain. Specification: Light flash, 530nm-950nm,640nm-950nm the point size of 15mm×50 mm, Up to 10 Hz.